Like most CIOs, Preston Simons started his job at Aurora Health Care by listening. But rather than respond with a technology plan, Simons knew he first had to build an IT organization capable of delivering. When I accepted the position of CIO at Aurora Health Care in 2015, the company was ready to invest in information technologies. Aurora is a not-for-profit integrated health care provider with 15 hospitals, more than 150 clinics, and over one million patients. My challenge was to take IT to the next level. Before I produced a business and a technology strategy, I knew that I had to build an IT function that could deliver on those promises. Beyond that, I intended to create an organization that is Aurora’s internal “supplier of choice,” as well as the “employer of choice” for our talented staff. This is why I chose to start with an organizational strategy. I engaged an expert on organizational strategy, Dean Meyer, even before I started my new job. Like most executives, I spent the first couple of months listening – up, down, and sideways – before making any significant decisions. But after that, I took an approach that was a bit more nuanced than most executives. Here’s what I did, and what it achieved. After about ten weeks of listening, I had most of the data I needed. Then, I spent four days in immersion with Dean developing and documenting my plan. I believe in Teddy Roosevelt’s advice, "Keep your eyes on the stars, and your feet on the ground." So, my plan began with a vision of all that IT should be at Aurora. This was not a short aphorism intended to be inspirational. It was a detailed description of what the organization should be able to do, in ten categories. For each of the ten categories, I wrote a few paragraphs that summarized my vision. These were not vague promises or values. They were specific deliverables and behaviors. But as specific as they were, taken together, this vision was comprehensive and far reaching. Of course, I made certain that everyone’s expectations were covered somewhere in these vision statements (including quotes where possible). But well beyond that, I described my own beliefs about what excellence in a shared-services function like IT means. Dean’s role was to repeatedly stretch my thinking. Incidentally, all the vision statements are based on my view that every manager should think and act like an entrepreneur running his or her own business within IT. Behaving in this way doesn’t make us passive order-takers, and it doesn’t require chargebacks. Instead, it means that every job is defined by what it produces (not what it does); and funding (my budget) is provided not to cover our costs but rather to “buy” our products and services. In my experience, this leads to great partnerships with customers, with clear and distinct individual accountabilities. And it induces an innovative, customer-focused, entrepreneurial spirit, as well as great teamwork and empowerment. Next, for each of the ten vision categories, I assessed the current state of the organization. Again, I incorporated the interview data (including quotes). A clear picture of the status quo emerged. The vision gave me a tough standard against which to evaluate our current state. I was able to point out something positive in each category. But as compared with my vision, there were many deficiencies – not just tactical technology issues, projects gone adrift and operational glitches, but some fundamental problems in the organization and the way it operated. Finally, I laid out my strategy. For each of the ten vision categories, I listed the few most pressing “triage” actions that I planned to tackle. Now, here’s where my job entry strategy differed from that of many executives: I didn’t stop there. One thing I’m adamant about: I hate rework. I simply don’t have time to solve the same problems again and again. That’s why I didn’t want to treat symptoms. I wanted to get down to the root causes – the reasons why our great people weren’t delivering that vision – and treat those fundamental problems once and for all. For each of the gaps identified in the assessment, Dean and I analyzed root causes, using his framework of the five organizational systems that determine the character of organizations and drive their performance. We found that most of the symptoms were the result of the same few root causes – problems in the design of these organizational systems. 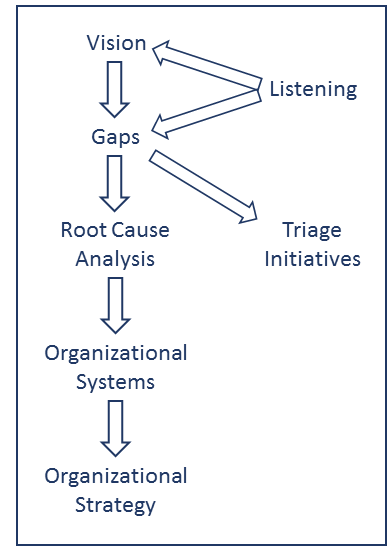 Triage Phase: Some issues were so pressing that we couldn’t wait for systemic solutions. But I knew I had to be judicious about what I put on this list. Every triage item would take time and attention away from the systemic phase. Systemic Phase: As soon as possible, I wanted to treat the organizational problems that were getting in the way of our performance in every aspect of our work. I defined organizational initiatives to address each of the root causes. An organization can only adopt a limited amount of change at a time, so I sequenced these organizational initiatives based on criticality to the company, my sense of urgency, and their interdependencies. Structure (Tier 1): My first priority was a quick restructuring, just at the level of my direct reports (tier-one). This was necessary to create key positions that were missing, so I could get started recruiting the senior leadership talent we were missing. We couldn’t afford the time for a comprehensive restructuring at this stage. But I intended to design the tier-one structure using the same principle-based organizational framework that we’d later use to do a comprehensive restructuring. That way, this quick first step would not be a throw-away, but rather a step in the right direction. Investment-based budgeting: When I first arrived, Aurora was nearing the end of its budget planning cycle. The CFO came to me, and with apologies for hitting me with this so soon after I’d arrived, she said we needed to cut the IT budget by a few percent. Neither my own staff nor financial staff could answer that simple question! The results had been devastating. After years of impossible “do more with less” proclamations, we’d severely underfunded critical challenges such as cybersecurity, regulatory compliance, deferred maintenance, strategic projects, and investments in our people. Demand management (governance): For years, the IT organization had been under pressure to deliver far more than its resources permitted – demand exceeded supply. And IT staff were eager to serve. As a result, we had a long history of over-promising and under-delivering. This damaged our reputation, and it left us with little time or money to invest in all the things I was brought in to do. I knew that more budget wouldn’t help. We’d just have the same problem on a larger scale. As Dean outlines in his book, Internal Market Economics, we had to install a demand-management process that empowers clients to decide our priorities within the limits of available resources (as provided by my budget). Then, anything else they wanted would have to be incrementally funded. Structure (remaining levels): In parallel with implementing demand management, I planned to invest in a comprehensive restructuring. Groups were spread across too many different lines of business, and some lines of business were scattered all over my organization chart. Boundaries were unclear, and groups were defined in vague terms (a few words in a box) and “roles and responsibilities” instead of lines of business. Also, we had independent “silos” of generalists instead of centers of excellence with cross-boundary teamwork. Reduced specialization meant reduced performance in every aspect of our work: efficiency, speed, quality, and innovation. Benchmarking: It’s important that we’re the “best deal” for our clients, and it’s up to us to prove it. Once the new structure has our staff focused on excellence in specific lines of business, we’ll be ready to benchmark our rates (unit costs) against cloud computing, contractors, and vendor services. Culture: At this point in the strategy, we’d have already had a significant impact on our culture, improving customer focus, entrepreneurship, accountability for results, teamwork, and empowerment. But the spin-off benefits of our work on our internal economy and structure are not the same as a comprehensive treatment of culture. Instead of preaching values, I take a behavioral approach. We’d craft our set of actionable behaviors – principles we can teach, model, and measure. In my experience, this leads to significant culture change in large organizations in less than a year. Once I’d written the vision, assessment, and strategy document, I shared it with my staff, my peers, and my chain of command. The results were quite rewarding. My staff became enthused about the vision. “That’s the kind of organization I want to work for,” they told me. Despite the fact that all these changes will stress them to the limit (in terms of both workload and learning curve), most were enthusiastically behind the transformation. Fewer than one percent chose to leave – not bad given the dramatic changes we were about to implement. Our clients seemed quite impressed too. They know that their success depends on IT’s success. But the vision went well beyond what they’d hoped to get from IT. And I think the well-structured plan reinforced executives’ trust in my abilities, and helped me gain the support I would need to execute the plan. Sure, it’s a multi-year plan, which is tough to sell in this era of “what’s in it for me NOW? !” But with a strong vision, a sober assessment, root-cause analyses, and a clear, step-by-step strategy, I think I earned a bit of patience and the time required to implement a meaningful transformation. Preston Simons joined Aurora Health Care in 2015. Prior to Aurora, Simons held the position of CIO at Abbott Laboratories, a Fortune-100 medical-device, nutrition, and life-sciences company. 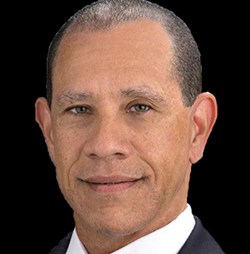 He is a member of the Board of Governors of the University of St. Thomas, Opus College of Business. Read our weekly e-newsletter packed with career advice and resources for the strategic technology leader, and information about active searches.